The Burning of Santo Domingo by Fernando Amorsolo, 1946-1949. 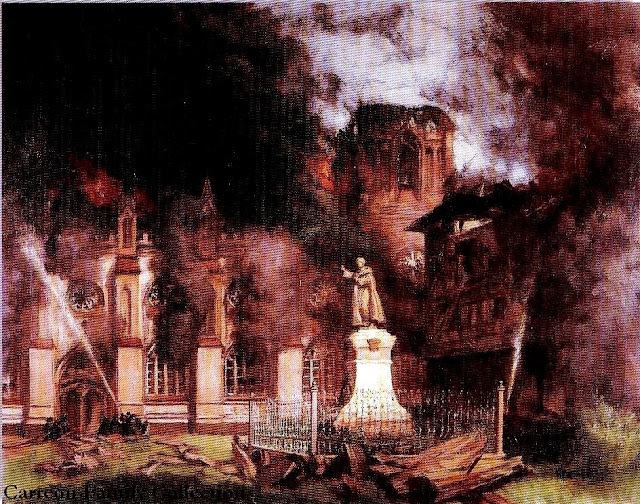 "Amorsolo was able to capture on canvas the magnitude of the fire as well as the concerted effort of the firemen and the clergy to save the sanctuary. Noteworthy was his rendition of intensity of the fire through the application of hues, texture, and perspective, which were his trademarks. His early works such as this have a hyper-realistic style. One fine example of a historical painting, it depicts the destruction of the Sto. Domingo Church brought about by the tremendous fire (Japanese bombs) that occurred in the 1940s." Read more about the Santo Domingo Church here.